That was the message that I got from Bayour Issa, Complete Sports veteran correspondent in Ilorin, Kwara State on Monday, June the 23rd. Bayour is called “Mr. Sports” in Ilorin because he breaths sports; in fact, his whole life is sports. 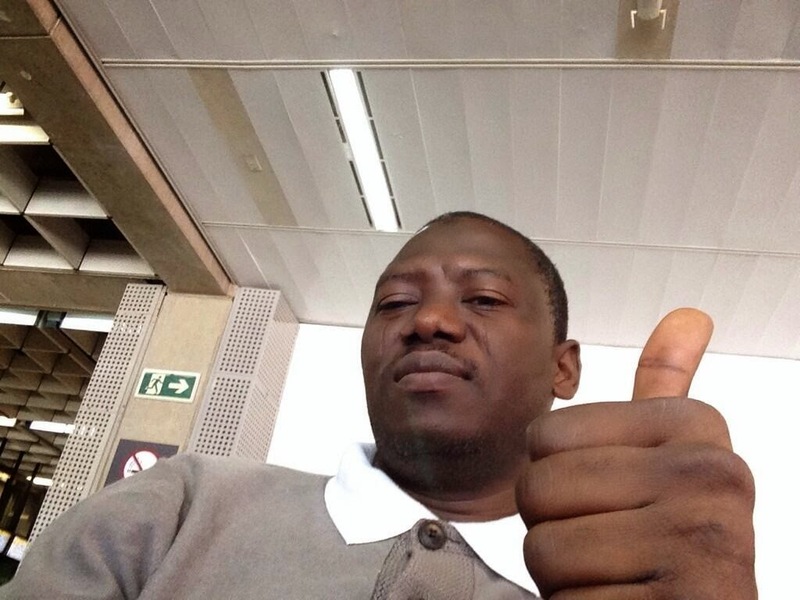 Today, Bayour’s wish is my command and I believe his wishes reflect those of my readers.It was inevitable that my World Cup diary would be influenced by the Super Eagles itinerary the moment Nigeria’s matches got under way. I’m here in Brazil primarily to report the Eagles and I couldn’t be focusing on my personal experiences while my team were at the risk of getting knocked out of the Mundial after that goalless draw with Iran in Curitiba. But, following their 1-0 victory over Bosnia-Herzegovina last Saturday in Cuiaba, I am a bit more relaxed to share what I’ve been up to these past few days even as the Eagles prepare to face Argentina in their final group game in Port Alegre. 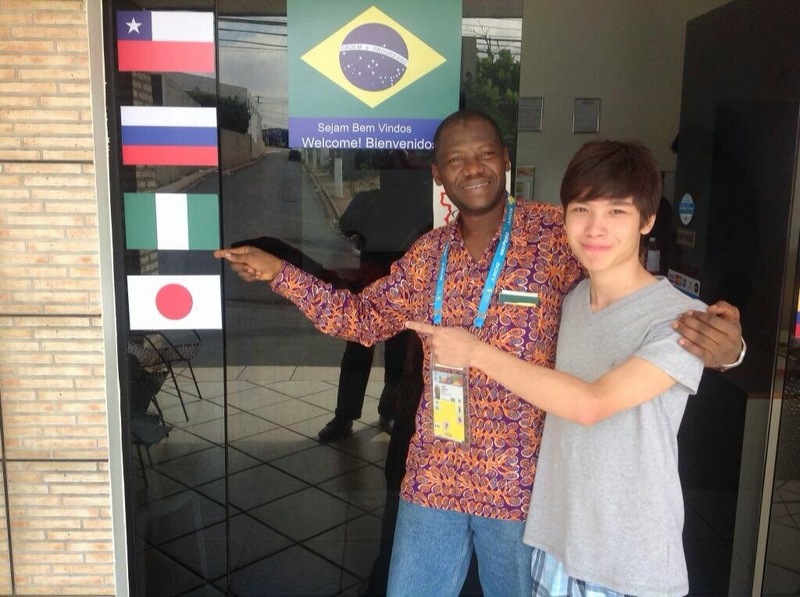 I arrived in Cuiaba with Kunle Solaja on Friday, June the 20th, a day before Nigeria’s match with Bosnia. We took an early flight and by 8 O’clock we were in town. We had not succeeded in booking an hotel before arrival, so we asked the World Cup reception desk at the Marechal Candido Rondon International airport to recommend one that was close to the Arena Pantanal where the match would be played. In the course of our search, we forfeited a deposit of 180 Reais at one hotel before we finally got what we wanted at Hotel Karreiros and booked for four nights. Kunle and I had decided to stay on in Cuiaba after the Eagles-Bosnia match so we could fly straight to Port Alegre for the Nigeria-Argentina match. What a brilliant idea that turned out to be. Unlike the noisy and fast-paced São Paulo where we came from, Cuiaba is a quiet city of only 600,000 people and very laid back. Founded in 1719 by Portuguese explorers from São Paulo, it Is situated in the most central part of the entire South American continent and is famous for its tropical weather which draws tourists to the city. Throughout our stay, the weather was as hot as what we normally experienced in Nigeria. No wonder Emmanuel Emenike and Mikel Obi were repeatedly looking for water breaks during the game against Bosnia. It was humid. We were received at Hotel Karreiros by Vitor, a pleasant 17-year-old boy who was the only one who could speak English among the staff. He would later reveal that he was actually doing a short vacation job at the hotel pending when he would resume at college (university) having just finished high school. Vitor served as our guide throughout our stay in Cuiaba. And when it was time to say goodbye, I felt a bit emotional as he hugged me and wouldn’t let go quickly. I collected his phone number and email address so we could keep in touch. I then sent him a message on Whatsapp promising to invite him to visit Nigeria someday. “That would be nice,” he replied. Vitor was not the only friend I made in Cuiaba. On the flight from São Paulo, I met Senad Sulic, a Bosnian who lives in Australia and has adopted a new name, Sam, so that his Aussie hosts would not have any problem with pronunciation. Senad works for Australian airliner Qantas and he flew 24 hours from down under to come and support his country of birth at the World Cup. Also on the flight with us from São Paulo was Josue, a Burkina Faso national who lives in California, USA and who came all the way to Brazil to support the African teams at the World Cup. Even though he now carries an American passport, Josue was cheering Ghana when they met USA in Group G. He was disappointed that Ghana lost the match 2-1 and he had come to Cuiaba hoping to cheer Nigeria to victory against Bosnia. Thankfully, the Eagles didn’t disappoint as Nigeria won 1-0. 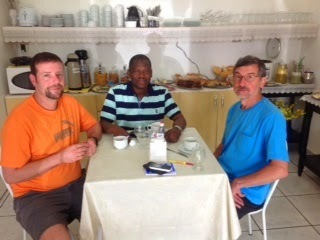 My final set of friends in Cuiaba were father and son, Mario and Mark who lodged with us at Hotel Karreiros. Mario is Portuguese by birth, but he moved to Brazil where he lived for many years before relocating to the United States where Mark, who is now a fully grown man, was born. Mario wore a Brazil jersey to show which country he wanted to win the World Cup, but he was in a serious dilemma when Portugal and USA clashed in Group G. The pulsating match ended in a 2—2 draw. At breakfast the following day, I didn’t know whether to commiserate or rejoice with Mario as Portugal had snatched a late, late equalizer to deny USA of victory. “I am Portuguese by birth, so I wanted Portugal to win,” he declared. His son, Mark, didn’t have any doubts about his own allegiance either. “I am a first generation American, so I wanted USA to win,” he countered. What a story of father and son. In retrospect, I am still amazed at those complex nationalities that I encountered in Cuiaba. 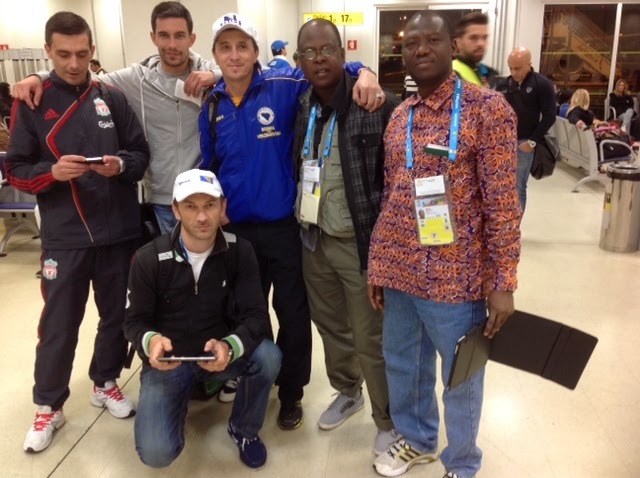 A Burkinabe-born American supporting Africa in Brazil; an Engkish-speaking Bosnia-Herzogovina-born Australian; a Portuguese-born, Brazilian-bred American father with an American son. And, at the media centre in Arena Pantanal, I also met an English journalist working as the South American correspondent of a French publication! How about that? The World Cup is so beautiful at bringing different nationalities together.That beauty was demonstrated in another refreshing way at the FIFA Fan Fest in Cuiaba for Brazil’s final Group A game against Cameroun on Monday, June the 23rd. I had been looking forward to attending another FIFA Fan Fest following my first experience in Durban during the 2010 World Cup in South Africa. 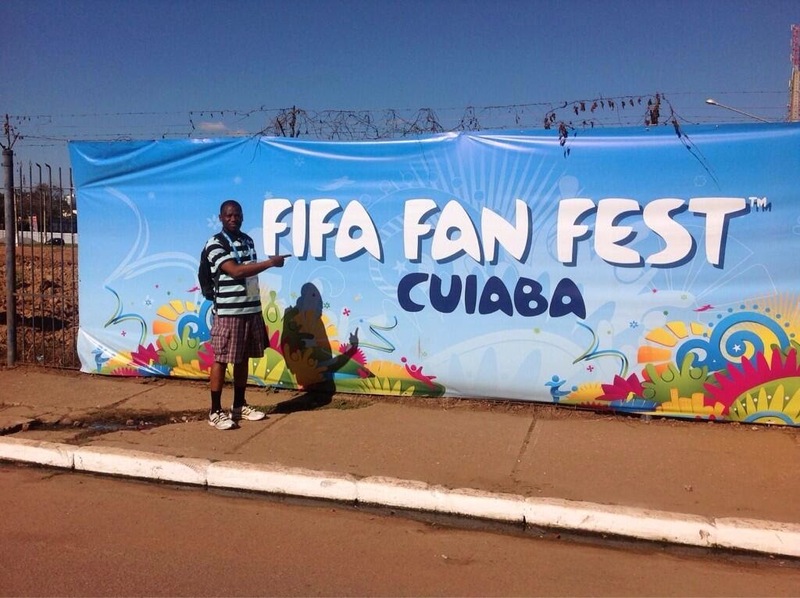 Kunle and I arrived the Cuiaba Fan Fest venue early to meet hundreds of people mostly clad in the gold and green colours of the Brazilian national team. Hundreds soon turned into thousands before our very eyes as the whole town poured in, practically. I saw a wrinkled old woman who must be in her ’70s or ’80s sitting not too far away from a baby being breast-fed by the mother. I saw a man the size of a whale wearing the alternative Brazilian blue jersey, just as a lady dwarf was passing by. 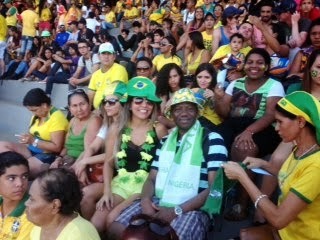 I saw hordes of beautiful Brazilian women and hordes of good looking men. I wish I could take photographs with everybody in the park because they were all so gorgeous. When people talk about Football being a religion in Brazil, this is what they mean. Men, women, young and old filled the FIFA Fan Fest dancing to popular music blasting from huge loud-speakers as they waited for the match to kick-off. When the match finally got under way and Neymar started spinning his magic against the hapless Camerounians, the fans simply went berserk. And, for every one of the four goals Brazil scored, fireworks rent the air. At the FIFA Fanfest in Cuiaba. The two Neymar goalscorers are right here with me! Kunle and I decided to leave the Fan Fest early so that we could get to the hotel before the multitude of people poured out at the final whistle? On the way out, we met thousands more fans just arriving and waiting on queues to get into the arena.Our taxi driver was generous as he left his meter to read for one passenger instead of two which would have cost us double the fare. All the roads were completely empty and shops were closed as we made it to Hotel Karreiros in double quick time. 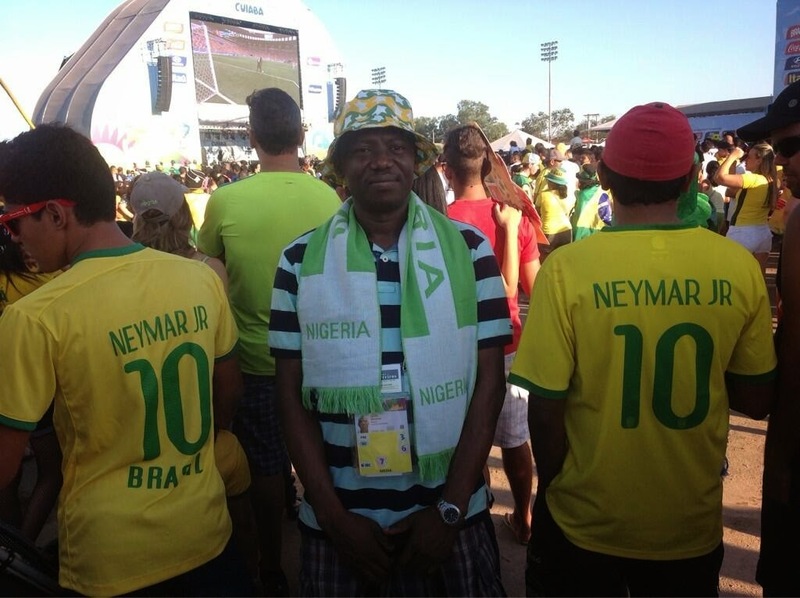 This was my most exciting day so far at the 2014 FIFA World Cup. I DEPARTED Cuiaba very early on Tuesday, June the 24th to catch the local Brazilian airline GOL’s 6.20am flight to Port Alegre where the Super Eagles will confront Nigeria’s World Cup nemesis, Argentina. The South Americans defeated Nigeria 2-1 in a group game at USA ’94; 1-0 in another group game at Korea-Japan 2002 and 1-0 in yet another group game four years ago at South Africa 2010. Based on the foregoing statistics, the smart money is on Argentina to beat Nigeria again at this year’s World Cup.Nigeria’s cause will not be helped by the fact that Port Alegre enjoys a proximity with Argentina which presents something close to a home advantage to Lionel Messi and company. Hopefully, the Super Eagles will have something to say about that as they seek second round qualification for the first time since France’98. Touchdown in São Paulo from Cuiaba. Waiting to connect another flight to Port Alegre. nice job. keep it up. dayo from iba. Excellent account. Keep it up we are enjoying it.